We are back in Copenhagen, the city of dives. 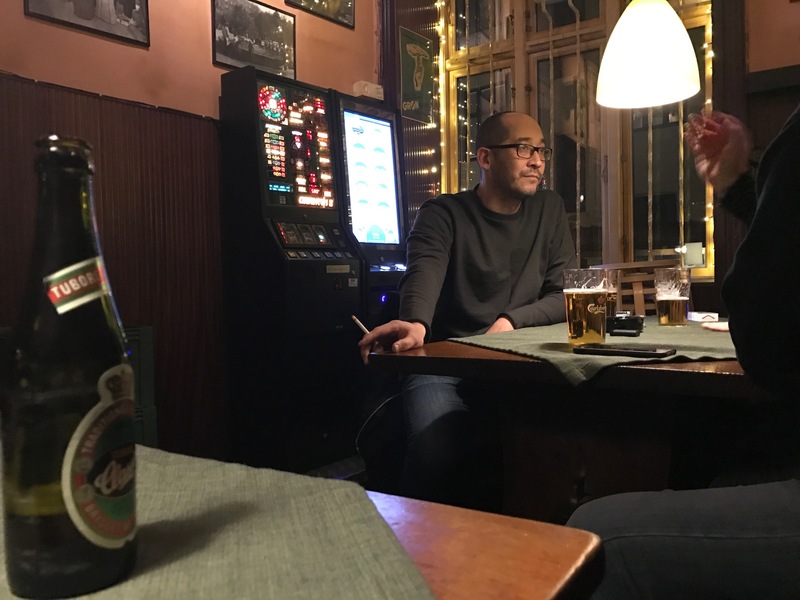 In my first article about this city I proclaimed it as the "dive bar capital of the world", a daring declaration which I intend to back up with ten different reasons of why this city is supreme to other places in this matter. 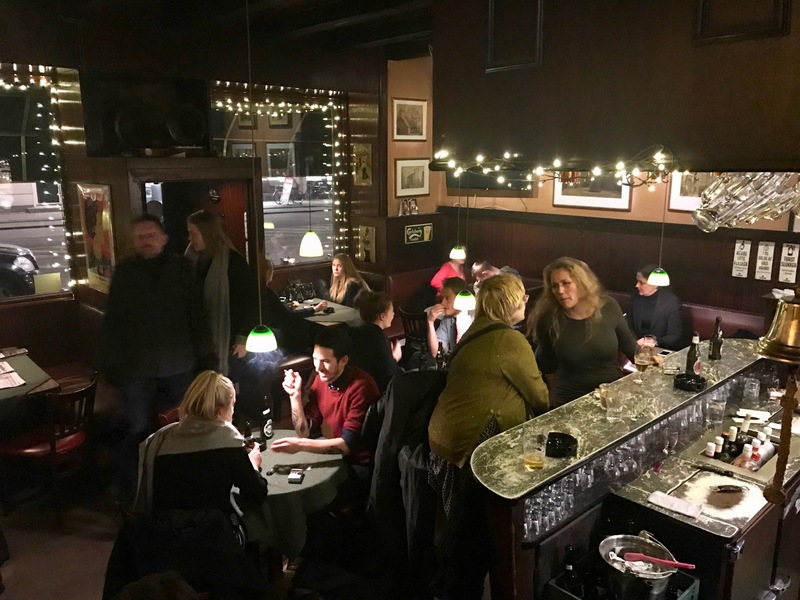 Last time, I wrote about the French-Danish hybrid Eiffel Bar, a beautiful gem down in the picturesque old sailor quarter of Christianshavn. That article was about the freedom of smoking inside, a scene that is becoming more and more rare in the public life of today. Now I am travelling to another side of town, to one of my favourite bodegas in Copenhagen. On the border of inner city area Indre By and upcoming Nørrebro lays Funchs Vinstue, a traditional Danish brown bar from the fifties. The name of the bar suggests that this is a house of wine and even though you can probably get a glass of cheap white here, it is surely not a place for the nervous wine nerd looking for some biodynamic hipster liquid. No, in this kingdom beer is king and these kings be Danish. 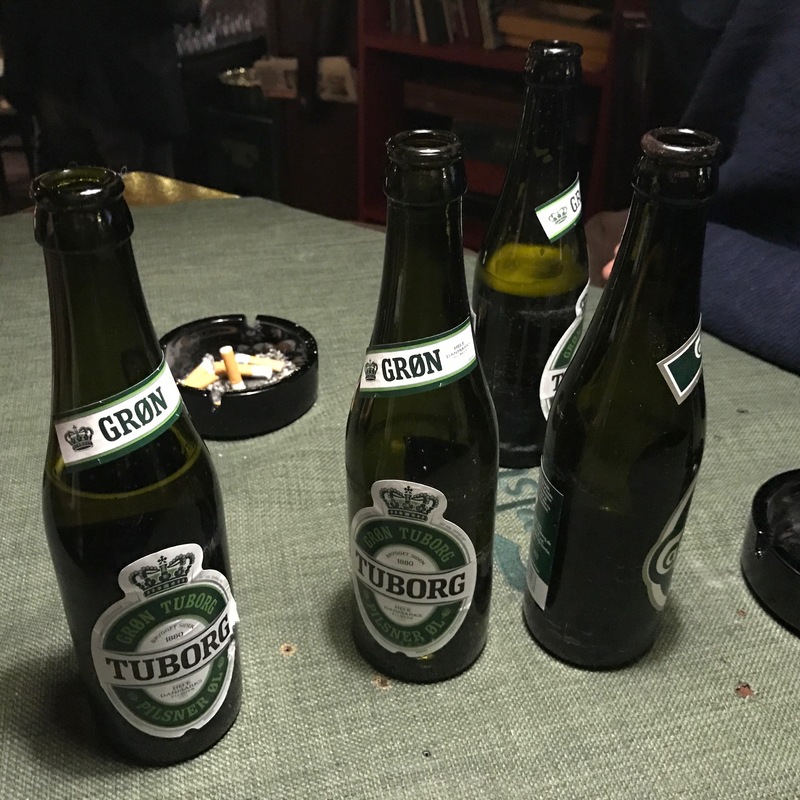 Tuborg and Carlsberg are the rivalling clans. 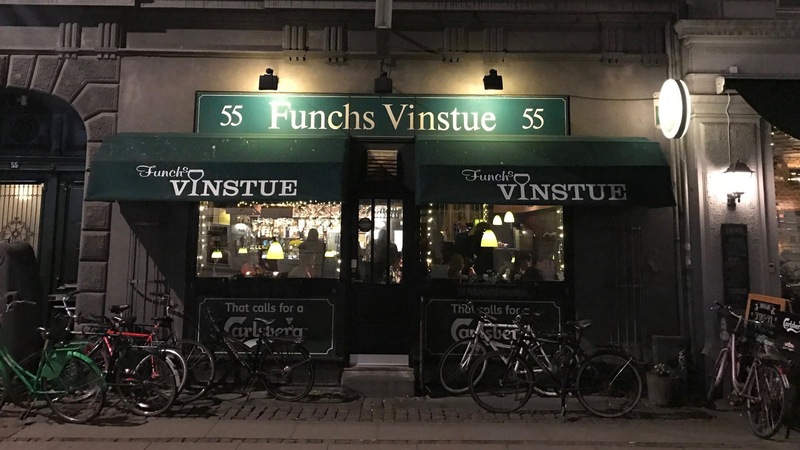 Actually, Funchs as it is commonly called, is not the only brown bar in Copenhagen to title itself as a wine house. You also got Hviids Vinstue, Toga Vinstue, Husmanns Vinstue, Vinstue 90 and probably many more that I don't know about. A part of the answer why these Nordic boozing dens persist to title themselves with products they do not rely on can be found back in the Danish 18th century. On 20th January 1783, the Danish government, in effort to stimulate the domestic economy, announced a decree saying that many foreign products was to be banned. Wine was one of them. The consequence of this was that the established wine houses had to sell Danish brewed beer instead and hence were the Danish wine houses selling everything but wine a historic reality. This deceiving way of terming some of the Danish bodegas has apparently sticked with time, even though the distribution of wine has clearly become legal. I come here often. It is perfectly situated on the way from connecting Nørreport Station and the bumping nightlife in Nørrebro. Specifically the location is a detail that attracts me. In one way, there is a big city feel about it. The bar is on the northern part of Farimagsgade which stretches all the way from Østerbro down to Copenhagen Central Station and from the outside tables you can see this street get crossed by Fredriksborgsgade, which after the lakes changes into one of Copenhagen's longest streets; Nørrebrogade. The urbane traffic and the wide area brings out a majestic feel, making sure to let you know that you are in the capital. I enjoy this. But on the other hand, there is still something very modest about the location. We have basically left the tricks of the inner city and the residential feel is more and more evident. The cute facade and the two small tables outside also speak of a more provincial setting. It tells us that there is no need to get worked up about the big scene and that all we need is here. When inside another detail comes to mind. Funchs Vinstue is because of some weird circumstance a masterpiece of Feng Shui. The Qi is booming in here. No matter where you take your seat, you will prosper of well being. The tables stand close and intimate so there is no cold space in the room, still you don't feel cramped or worked up about what's happening behind your shoulder. 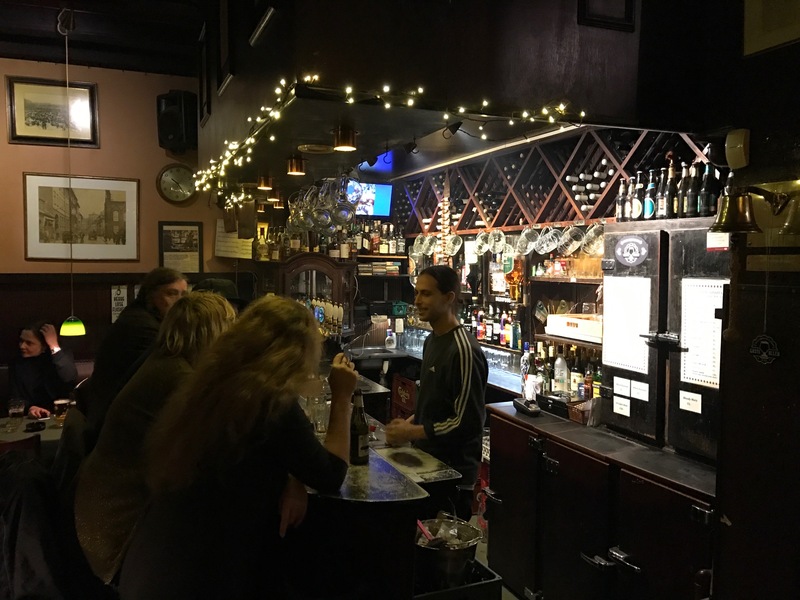 The whole bar has a wide and deep body that gives you a good sense of what is happening around you and there is a connection with the other patrons without this being too intrusive. The seating area is also shaped as the letter L and as the small tip is a couple of stairs higher than the rest of the premises the space feels bigger than it actually is. It is all quite brilliant. This locale was born to be a bar and the person that planned it had a real talent for it. More thoughts. While nestling at my small table in one of the corners I feel like a KGB-agent from the fifties, waiting to deliver some secret documents to an American protagonist. For this, I will of course gain nothing more than the undeserving death of a supporting actor with an eastern accent, but that doesn't really matter now. Right now I'm alive and I am really keen on delivering those bloody documents. 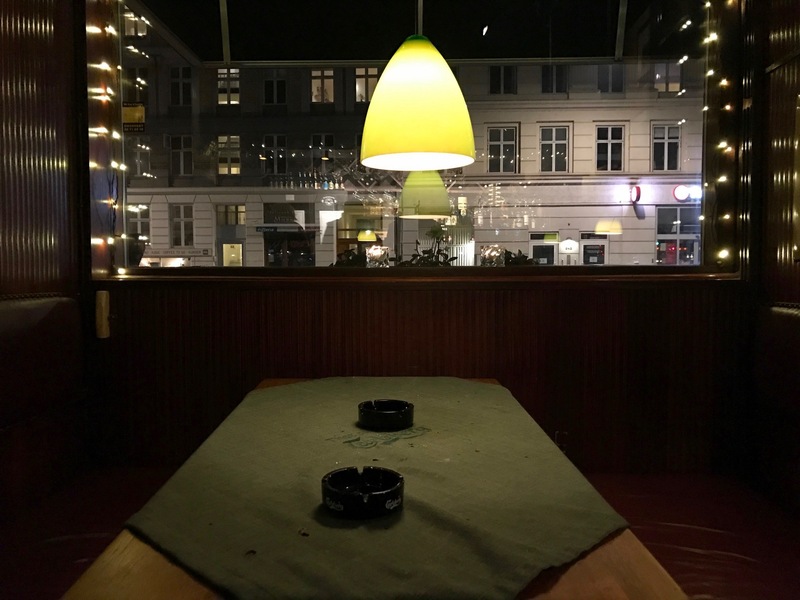 The dark green table cloth in front of me gets light from the typical retro lamp above my head and the ashtrays are full of cigarette butts as we clearly haven't understood that smoking is a killer. Not yet, this is the fifties. Eisenhower, Presley, poodle skirts and Sputnik 1. And a Copenhagen bar dressed in dark jacaranda wood. This is the fifties of cool and mystique, far away from the red and white chess floor-bars often associated with the decade. Here is brown liquor being served, no milkshakes. Here goes Billy Wilder and Alfred Hitchcock, not Fonzie or Marty McFly. This is the fifties of fifties, not the grotesque retro-interpretations that has been made afterwards. Funchs Vinstue is a popular place. In contrast to some other bodegas, there is a cool blend of both old and young people here and towards the late hours the atmosphere can get quite rowdy. Yes, the late hours. How we all love those late hours. Or should I say the early hours? It is anyway the subject of today. The liberal opening hours of the Danish bodegas is one of the key elements in their brilliancy. I am not going to convince you that Copenhagen is one of the great 24-hour cities. I am not going to play that card. This isn't New York, questionably recognised as the city of cities that never sleep. This is not Cairo either, the actual city with the most nighttime activity in the world. Neither is it the Buenos Aires of grand avenues with 24-hour cafe bars and it ain't either the drugged out circus of East Berlin. Furious Madrid it is certainly not. Copenhagen is too small a city to compete with these big sharks of nocturnal pleasure. But still I can't come up with another one-million city that challenges the night like Copenhagen, especially not on these northern altitudes. During the weekends the vibrant club scene doesn't stop dancing until eight in the morning and if it does, then you have definitely hit the wrong party. Normally, bars stay opened until late and that is because people demands it. Danish people knows their right and they won't settle for less. The Danish bodegas are a big part of this. It is often to these humble places you end up at least once in the morning. This is where you drag your decadent following for a quick one, a strong one or a disastrous one. Never a boring one. They don't go on forever but they are still keen to give you their service whenever they can. And it is not necessarily about staying open late. After late comes early, just as sunshine follows rain. You can for instance stay at Funchs Vinstue until five o'clock in the morning and then get some night grub, skin one up and then get to another bodega that opens at eight. At ten o'clock the doors are open again at Funchs and that is pretty much the full circle. The early openings of many Danish bodegas is actually what makes the nightlife (which at this hour of day is a confusing term) of Copenhagen so special. This city is very forgiving like that. If you feel like buzzing on a last (or first) beer in the morning there is nobody that is going to raise their eyebrows. Instead, they are probably going to salute you and wish you well. Maybe they will even buy you a round. At the bodega no one has to feel ashamed of their life situation or the decisions they have made. In here we are all naked in front of each other. No matter if you try to land from a pill or if you are in desperate need of a beer before clocking in at your excruciating job. And it can be quite a scene sometimes. Imagine coming in at an empty brown bar in the morning hour just to savour a last moment of eternity with a cold beer. As there is no sign of life, except for a sullen barmaid, you'll feel ready to close the books. But step by step, discrete phantoms are slinking through the doors, crawling up to their barstools like flies to an open jar of marmalade. Suddenly you find yourself in the middle of a nine o'clock mayhem, a rush hour of another world. Bottles are clinging, foul but charming remarks are made and the jukebox gets warm for another day. The Danish bodega has risen all over again. Drinks? No surprises here. Danish beer on bottle. Brown liquor on the side. Great prices on draft beer as well. 18 DKK (ca 2,4 €) for half a litre before 3PM. Munch? I have never done it myself but apparently they stack up a trey with Smørrebrød every day that they sell until they run out. Considering that Funchs is a smokers bar this may not be for everyone but what I heard is that these sandwiches are quite good. Where? Nørre Farimagsgade 55, 1364 Copenhagen, Denmark.